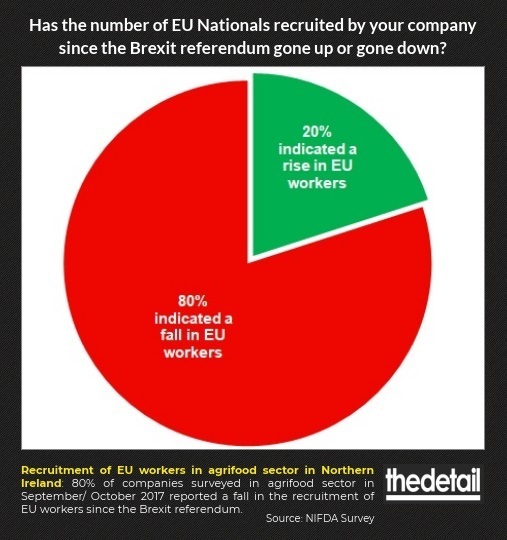 SOME 80% of agrifood companies in Northern Ireland saw a fall in the recruitment of workers from the European Union (EU) since the Brexit referendum, according to a previously unpublished survey obtained by The Detail. The employer survey carried out by the Northern Ireland Food and Drinks Association (NIFDA) reveals that businesses in the agrifood sector have experienced recruitment difficulties since the UK voted to leave the EU in 2016. The Harvesting Tomorrows Skills (HTS) survey was carried out between September and October 2017 and found that 80% of respondents saw a fall in the recruitment of EU workers since the Brexit vote. This comes as The Detail reveals a 26% fall in EU workers in Northern Ireland since the Brexit vote and concerns over a skills and labour shortage – see here for full story. The NIFDA survey sampled the views of 23 firms in the agrifood sector, which collectively employed close to 5,000 staff. The size of the companies surveyed ranged from five staff members to 1,200 employees. The findings, obtained by The Detail from the Department of Economy under Freedom of Information legislation, also found that almost 70% of respondents had experienced a “moderate or severe level of difficulty in attracting new workers”. The companies surveyed reported having a dependency rate on migrant workers that ranged from 0% to 90%. The uncertainty posed by Brexit also impacted on recruitment, with 19% of firms saying “always”, 48% saying “sometimes”, and 33% saying “never”, the survey found. Of those surveyed, 30% said their recruitment budget had increased since Brexit, while almost two-thirds said currency value was impacting on recruitment. A workshop on the HTS survey findings concluded there was “an alarming level of migrant employee dependency” and that current employment difficulties posed a “new scenario” for businesses in the sector. Collectively the companies estimated a need to recruit close to 700 staff in the year ahead. A workshop on the survey findings also found that labour issues were having a “negative effect” on economic outputs. One survey respondent commented: “We are already finding it difficult to harvest our raw materials due to the decreases in migrant labour. We have taken on some local labour to do the job but inevitably they only stick it a day … or less. This is a huge threat to our business”. Another company taking part in the survey said: “Labour is now our biggest headache and largest growing cost”. The NIFDA survey found that businesses were reporting increased pressure on other staff (71%), increased cost on overtime and recruitment (67%), difficulty maintaining production levels (48%), long standing vacancies (38%) and an inability to grow their business (24%). Around one third of companies said they were looking outside of Northern Ireland for staff, while the majority were upskilling existing staff and more than half had increased salaries. “We need to plan how we meet the challenge of the decreasing levels of migrant workers,” a report summarising the conclusions of a workshop on the NIFDA findings stated. The survey was carried out as part of a NIFDA project supported by Invest NI to address skills gaps in the agrifood sector. The NIFDA survey results were shared with the Department for Economy (DfE) this year, which in an internal memo acknowledged that the findings were “pretty reflective” of the industry. The DfE internal documentation, obtained under Freedom of Information legislation, stated there were clearly “major implications” for the industry as Brexit is “exacerbating an already difficult labour market”. The report stated: “This may also be compounded by similar labour/skills shortage identified within the hospitality and tourism sector. “It appears that in order to fill the skills gap, the sector is going to have to make jobs more appealing if they are to attract more local labour, particularly if the target group is the economically inactive, or those on benefits. NIFDA Executive Director Michael Bell told The Detail the shrinking pool of EU workers was a “huge concern” for the agrifood sector in particular. The NIFDA chief said the “eating ecosystem” in Northern Ireland, which includes agrifood and related industries, employed in the region of 100,000 staff and accounted for 20% of the private sector workforce. Mr Bell said: “It’s definitely a significant challenge for the agrifood sector going forward. There is increased competition in the wider economy for what is now a diminishing pool of foreign national workers. He added the lack of certainty posed by Brexit continued to present the greatest challenge for agrifood businesses: “There is no clear understanding of where we are going. Take farmers and meat producers, for example, it takes three years to produce a sirloin steak and we’re currently rearing animals that will enter the food market post Brexit but we do not have the clarity needed to plan for the future”.